Director: Emmanuel Thomas, M.D., Ph.D. Since completing a Doris Duke Clinical Research Fellowship and graduating from the University of Miami Miller School of Medicine in May 2007, I have made steady progress toward creating and implementing a translational research program focused on preventing liver disease and hepatocellular carcinoma. Our project leverages resources and clinical/scientific expertise available through the Miami CTSI, the Schiff Center for Liver Diseases, the Sylvester Comprehensive Cancer Center and the Miami Center for AIDS Research to address the rapid development of liver disease and Hepatocellular Carcinoma which occurs in patients coinfected with HIV and HCV. Infection by both of these viruses impacts our South Florida community significantly and our efforts will help minimize their detrimental effects in our catchment area. There has recently been a lot of interest in HIV/HCV coinfection. My area of expertise is in viral hepatitis and on the mechanisms by which Hepatitis B and C cause liver disease and hepatocellular carcinoma. Having been raised in Miami-Dade county, I have a strong commitment to improving the health of our local community. Recently, breakthroughs have been achieved in the treatment of viral hepatitis and specifically for treatment of HCV. Potent all oral therapies are now available to cure patients with HCV infection. Through our community screening program, we are identifying HCV infected individuals and linking them to care so that they can be cured of this deadly virus. In addition, we are also facilitating the ability of uninsured patients to receive these costly medications through patient assistance programs. Jinhe Hyun Ph.D., Postdoctoral Fellow; 10/2014-Present. Masato Yoneda M.D., Ph.D., Postdoctoral Fellow; 10/2013-Present. Miguel Santiago Montana, UM Undergraduate Student; 8/2012-Present. 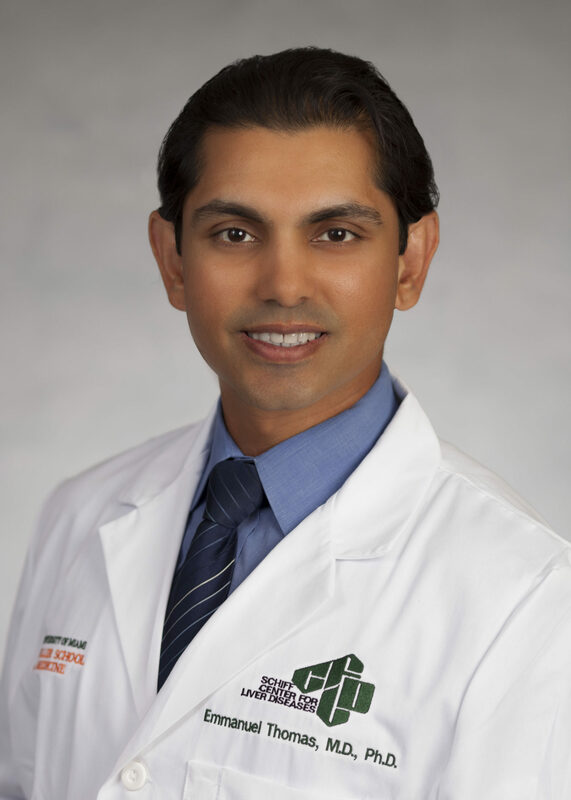 Vibhu Chitajallu, UM HPM Medical Student; 8/2012-Present. Danielle Turnquest, Florida Memorial University Student; Howard Hughes Medical Institute Undergraduate Scholars Research Program; NIH Diversity Supplement. Summer 2013-Present. Ryan is currently a second year medical student at the Florida Atlantic University Charles E. Schmidt College of Medicine. 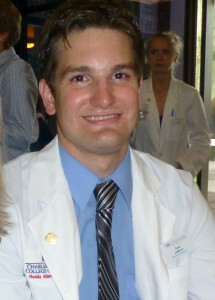 He joined Dr. Thomas’ lab in August of 2012 during his senior undergraduate year at the University of Miami. He conducted experiments on Hepatitis C virus infection of primary human hepatocytes and hepatoma derived tumor cells. The areas of study included the mechanism of action of agents used to treat HCV infection, specifically interferon and ribavirin. Ryan also served as a research coordinator at the Schiff Center for Liver Diseases working on diagnostic research studies related to HIV and viral hepatitis, before matriculating to medical school. He returned during the summer after his first year of medical school to continue his research work. Fernando J. Martinez, 3rd year GI Fellow; 8/2012-2014. Eriko Masuda, 3rd Year UMMSM Medical Student; 7/2013-2014. Nicholle A. Padrino, UM Undergraduate Student; 8/2012-2014. Nicholas Kunz, UM Undergraduate Student; 8/2012-2014. Francisco J. Gortes 1st Year UMMSM Medical Student: 8/2012-2014. Erik Kjell 2nd Year Medical Student from Sweden: 6/2013-12/2013. Leo Stenström 2nd Year Medical Student from Sweden: 6/2013-12/2013. Pejman G. Mansourian, 4th Year UMMSM Medical Student; 8/2012-8/2013. Michael K. Rao, 2nd Year UMMSM Medical Student; 8/2012-8/2013. Nadege Alcime Miami-Dade College Student-Biotechnology Program; 8/2012-8/2013. Zachery Austin, Morehouse College Student; Leadership Alliance Program; Summer 2013. Katrina Montane, Hialeah High School Student; Howard Hughes Medical Institute High School Scholars Research Program; Summer 2013. Paolo Scalla, Gulliver Prep High School Student; Howard Hughes Medical Institute High School Scholars Research Program; Summer 2013. Leronne Perera, Suncoast Community High School Student; Volunteer; Summer 2013.